Expression is designed to free digital professionals everywhere from the shackles of inadequate frameworks, CMS and eCommerce software - without the heavy lifting. Enjoy the freedom to customize as much or as little as you like with the convenience and stability of a cloud-based framework that keeps you on the cutting edge. Best of all, Expression scales from one site to thousands, letting you manage your digital business, whatever that is, in a single and efficient user interface. Expression is a Framework as a Service allowing you to build web applications on a solid and open foundation instead of starting from scratch. Use the power of Bundles and reap the benefits of total portability, version control, and having access to your best work wherever you are in the Expression universe. Slice and dice your data using Expression's powerful API. Easily integrate any of your projects with REST and SOAP endpoints, or slice and dice your data any way you see fit. From Google Analytics integration in the Administration panels to easily customized URLs and content, Expression can get you way up on the search engine ranks. Expression’s extensible development environment integrates templating, hosting, data-mining, and server-side business logic into a unified stack that will get you building awesome stuff fast. Expression lets you marry content, marketing, eBusiness, and custom features seamlessly into cohesive online experiences that deliver on brand and business requirements. A full featured development platform that doesn't get in your way, gives you everything you need up front, and delivers your wares via the cloud. Forget about maintaining servers or installing software and focus on what matters - writing web applications that work sustainably for everyone. Like getting your hands dirty, but don't want to work that hard? Take Expression for a test drive and get the best of both worlds. Easily manage your people with fine-grained control. Featuring a robust and extensive user model, Expression's got the tools to keep everyone under control. Expression comes standard with multilingual support that extends from its killer CMS, powerful eCommerce engine, all the way to the display layer. Speaking in tongues has never been easier. Expression Tag Sources bring the business layer into the light. 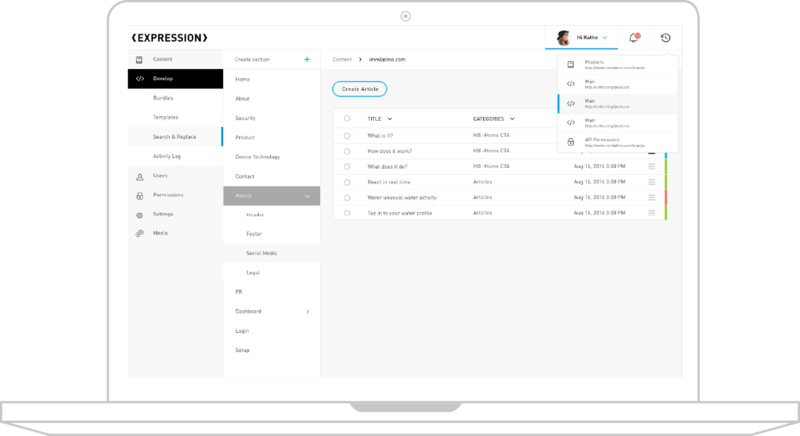 Give your front-end team unlimited access to system data and produce inspired user experiences without compromising the core. 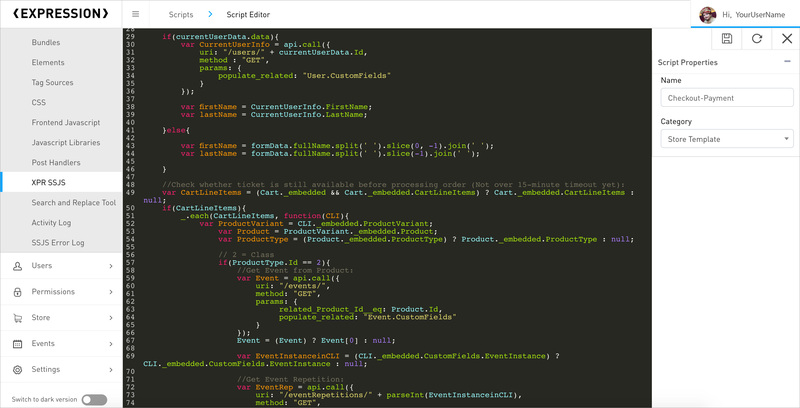 Fearlessly build and edit live projects and preview your changes in Developer Mode. No matter how simple or complex the change, you and your clients can see into the future with no impact on the past. Manage and host multiple domains, Clients, and Users on a single Expression instance. Standardize your workflows and manage all your digital assets in one place. Warm up your application development with Expression Bundles - packages of your best code that plug into any Expression project - and reuse your most inspired work. Focus on writing your applications worry-free. Expression lives in the cloud in multiple state-of-the-art data centers, giving you the assurance that you'll never go down. Expression's web-based IDE lets you get unfettered access to the code, while its Git integration also lets you stay within your comfort zone and work how you want. Real time API logging tracks every PUT, PATCH, POST and DELETE with timestamps, user info, and IPs to help you track down who did what, and when! 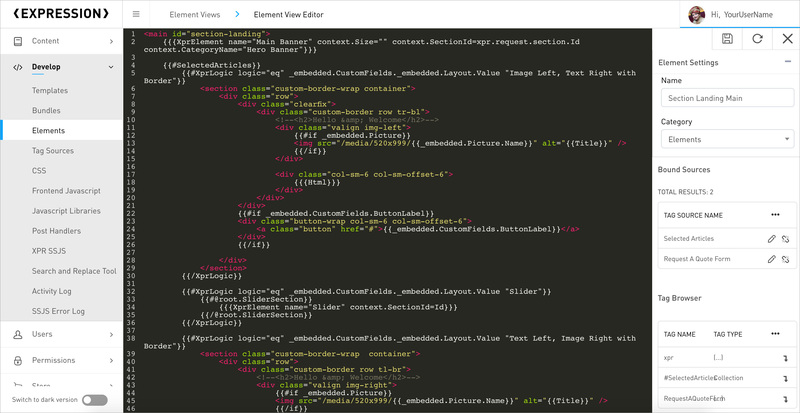 Bespoke workspaces for HTML, JS, and CSS, Expression Elements connect the front end to all your data and business logic. They feature a familiar developer UX, a Handlebars approach to display logic, and the ability to locally bind data into easy-to-consume Expression Tags and Tag Sources. Simplify your data objects for use in the render layer. Use Tag Sources to mine contextual information from any API using simple JSON configuration files, then use that data as abstracted Tags in Expression's Elements via handlebar inspired templating. Where it should be, right at your fingertips. Use SSJS to customize your application, or build it out from scratch. Utilize pre and post API execution hooks, API overrides, as well as your favorite utility libraries to get the results you need, faster than you've ever dreamed of. Squash those nasty bugs in your code and speed up pages using Expression's built in trace and profiler tools, or browse the SSJS Exception Log and get the diagnostics to solve stuff fast. Use Expression Pre and Post Handlers to create custom forms with built-in validation, submission tracking, and handy JSON-based storage to get your data where you want it. Got some Element markup in trouble? Use Expression's Search and Replace tool to easily find and fix every instance, with diff and syntax highlighting, plus previews of your changes. When you work with Expression your best ideas are not only possible, but your developers will love every challenge you throw at them. Expression speaks fluently to your favorite marketing platforms, gives you powerful Content Management and eCommerce functionality out of the box, and will delight developers with its ability to make sense of even other people's work. Feel like you're in control when you build with Expression. Your developers will love you, your clients will see results, and you can take your digital dominance straight to the bank. See performance at a glance with Expression's eCommerce dashboards and reporting. View your data as insightful graphs or download CSVs and crunch the numbers your own way. Expression integrates easily with all social media platforms. Get creative and build innovative social experiences, and take your tools with you to every new site you build. Expression comes standard with multilingual support that extends from its killer CMS and powerful eCommerce engine, all the way to the display layer. Speaking in tongues has never been easier. Battle tested in the enterprise, Expression has seen it all. Featuring multilingual support, publishing workflows, permissions, and an open API, you can manage content with confidence. Expression lets you manage users and groups, control what they do, and how they do it. From a single PDF to an entire site, controlling who sees and does what has never been easier. Yep, that's still there. Expression's WYSIWYG text editor will make you feel like you're in MS Word with all your creature comforts. Don't worry; you can rest assured that some things never change. What does that mean? Well, picture this. Create lists of content, easily choose how they look and behave, sort them on the page, and voila! Beach time. 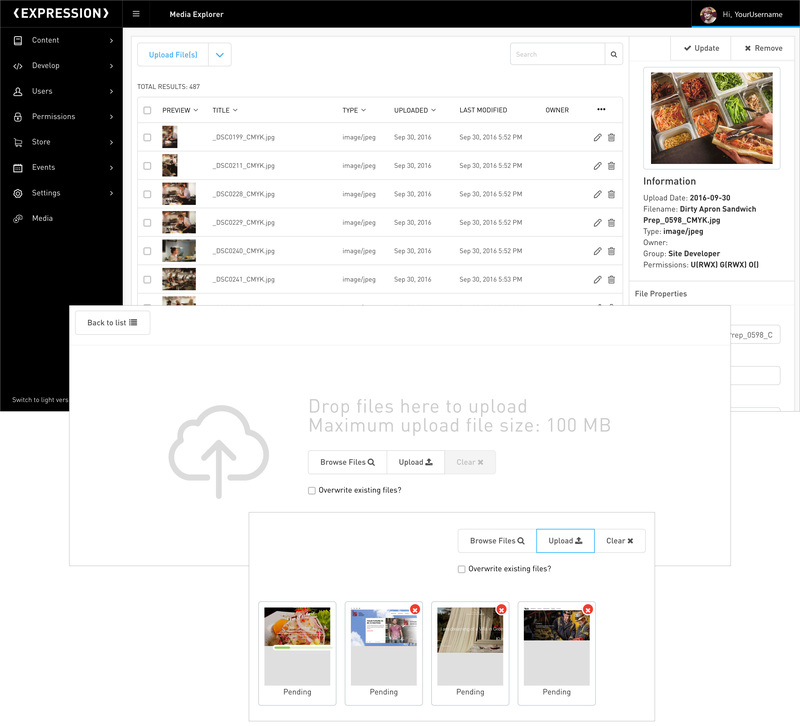 Easily manage your files and media in Expression's Media Explorer, featuring powerful search functionality, permissions, file-level property access, and some drag and drop just for fun. Build a business, not a toy. We're not just talking shopping carts. 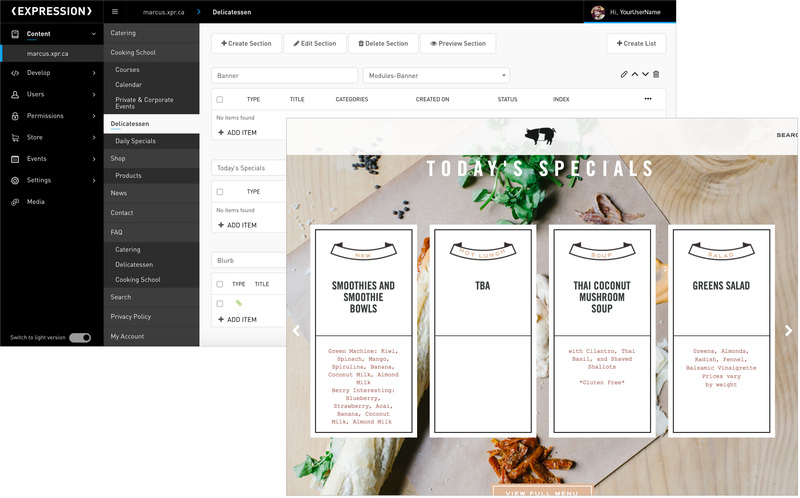 Expression's built-in eBusiness framework is engineered to take even the most complex inventories online, while freeing you and your developers to sell your wares on the cutting edge. Featuring a completely open API, you can mix and match data and integrate with any third party to build killer shopping and brand experiences online. Plus, our extensive reports and dashboards will give you the bird's eye view you need. We're looking for smart people in the biz who want to partner with us. Get under the hood now and let's start talking!